Richard Corbet, whose name is sometimes spelled Corbett, was an English metaphysical poet and a Church of England bishop. His poetry is seldom heard of these days but he was known as a popular and witty writer during his lifetime. He was born some time during the year 1582 in the Twickenham area which lies to the south west of London. 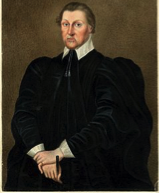 He was the son of a prominent nurseryman who was able to provide Richard with a good education, beginning at the Westminster School and then at Oxford university. A career in the church followed and he gained the favour of King James I who appointed Corbet as one of his royal chaplains. The king gave him this preferment in recognition of his “fine and fancy preaching”. Corbet soon advanced in the church, moving from the post of vicar of Stewkley in 1620 to dean of Christchurch College, Oxford. By 1628 he was the Bishop of Oxford and four years later he moved on to become Bishop of Norwich. He was known as an anti-Puritan but, despite being in an influential position in Norwich, he did little to repress the activities of Puritans in the city. Although he was obviously a serious-minded cleric, Corbet was also known for his practical joking and the occasional scatter brained approach to his work. A good example was the day he was meant to give a sermon in the king’s presence and he was so engrossed in the admiration of a ring that James had given to him that he completely forgot to deliver the sermon! As a poet he associated himself with the metaphysical school which included the likes of Andrew Marvell, John Donne and Ben Jonson. There are stories of Corbet’s carousing around the taverns of London with his close friend Jonson, while both were young men. Donne was a fellow Church of England cleric, and another friend of Corbet’s, and he wrote sensual love poems and sonnets amongst other pieces of work. 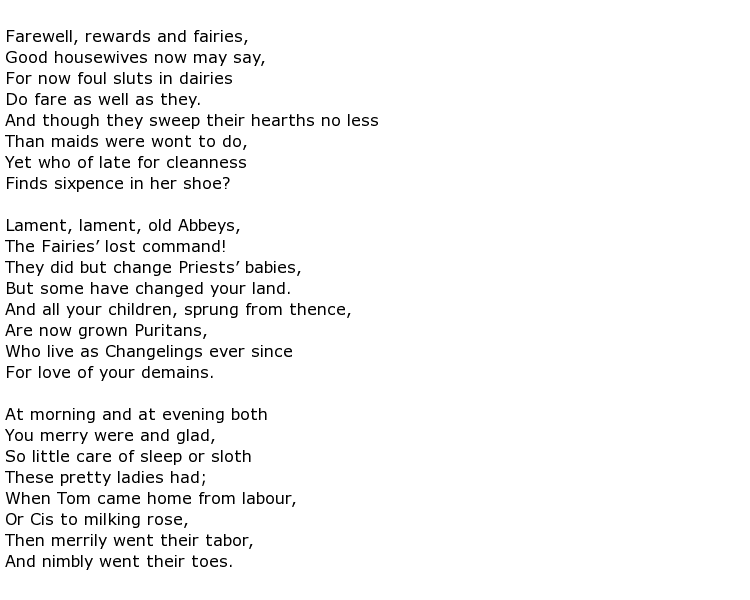 In comparison, Corbet’s work is often described as mostly “doggerel”, an irregular style of writing that can often be found in songs written specifically for children and nursery rhymes. None of his work was published until 1647, which was twelve years after his death. Although his Fairies piece was certainly of a serious nature the rest of his work could best be described as lively and satirical. Richard Corbet died in Norwich on the 28th July 1635, at the age of 53.